Are you a tea lover? Are you interested in trying out different varities of tea? Then you are at the right place. Teavivre is sponsoring this giveaway and is ready to give out tea samples to 4 lucky winners and each will recieve 4 different samples of tea. But before you proceed to rules and conditions, I am sure you would want to know about Teavivre. So here you go. TeaVivre is a group of tea lovers and aficionados from China, Canada and France, who all share a passion for drinking great tea and appreciate the healthy life style it brings. With all of us living in China, we frequently travel through the country visiting China's tea plantations so we can track down only truly exceptional teas. As a result we are able to bring to you – and us – the absolute highest quality Chinese teas that are, wherever possible, 100% organically grown and produced. At TeaVivre we invite you to share in our passion for truly great tea, and it is our pleasure to give you the chance to discover and explore Chinese teas that we drink daily. You can check their website by clicking here. I want to keep this giveaway simple, so you have only 2 mandatory conditions. 1) Like our facebook page. 2) Click here and like "TeaVivre" page on facebook. This giveaway starts on 25th October,2012 and ends on 9th November,2012 IST. 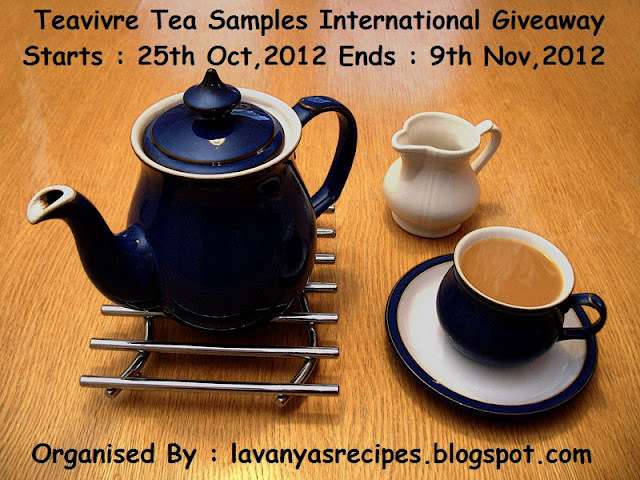 This is an international giveaway and Teavivre offers worldwide shipping. The winner will be selected by me using random.org. Good Luck everybody!! Let's see who are the lucky winners who will get to taste this high quality tea from Teavivre. Note: This is a sponsored giveaway from teavivre. The products in the giveaway are owned by Teavivre and Teavivre holds the responsibility of tea samples and their shipping. You are qualified for the giveaway. Good luck! I know about this great tea and it is now increasing its popularity in worldwide. Love it. You are qualified for the giveaway Sanoli. Good luck! You are qualified for the giveaway Priya. Good luck! You are now qualified for the giveaway Babitha. Goodluck! You are now qualified for the giveaway Viji. Good luck! I already liked your page. I liked the TEAVIVRE page too. You are now qualified for the giveaway Preeti. Good luck! I cannot find ur name in FB followers list sara. Pls check n confirm. As it goes without saying I love tea, so samples from a new vendor would be awesome, always looking for a new source to buy from. omg..how cud i miss this contest..i am a teaholic...this contest is for me..
You are now qualified for the giveaway. Good luck! Iswarya you are qualified for the giveaway. All the best dear! No problem. Better late than never!